LDAP is a core authentication protocol that was developed by our advisor, Tim Howes, and his colleagues over two decades ago. LDAP spawned a whole industry of solutions, including the open source platform OpenLDAP and the commercial solution Microsoft Active Directory®. As a standard, many systems and applications would end up integrating by leveraging the LDAP protocol. A new generation of cloud identity management solutions is also leveraging LDAP. The modern Identity-as-a-Service function of cloud LDAP is an important capability for next generation Active Directory and OpenLDAP-like solutions. Historically, IT organizations have leveraged the LDAP protocol for Linux server authentications and more technical applications, such as MySQL, OpenVPN, Docker, and others. First, do IT organizations want to install, configure, and manage OpenLDAP? Next, how will they secure a solution that was meant for on-prem environments with the modern-day cloud architecture? Finally, do IT organizations have enough LDAP experience to work through the arcane and complex integrations? OpenLDAP has operated as an on-prem application. IT admins would have to purchase hardware, install the OpenLDAP software, and then configure the directory service. Once configured, IT admins would then connect their systems and applications to the OpenLDAP directory. This all required time, effort, and expertise on the part of the IT organization. Further, because authentication is a 100% uptime service, IT was also responsible for ensuring redundancy and high availability of the OpenLDAP platform. This all added significant overhead to IT. 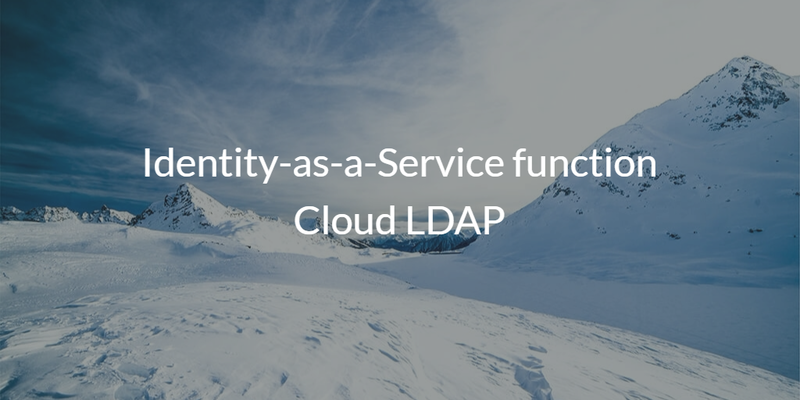 The Identity-as-a-Service solution Directory-as-a-Service® introduced a cloud-hosted LDAP service (also called LDAP-as-a-Service). With the OpenLDAP server hosted in the cloud, IT admins off-loaded a great deal of the implementation and management process. Cloud LDAP simplifies standard integrations with hundreds of applications integrating the cloud LDAP solution with cloud servers or applications. With a global network of LDAP servers, the SaaS-based LDAP service is highly available and redundant. Furthermore, the cloud LDAP functionality is a piece of a broader cloud directory service that includes centralized user management, cloud RADIUS, multi-factor authentication, device management, True Single Sign-On™, and more. A user’s credentials can be used for their systems, applications, and networks. If you would like to learn more about the Identity-as-a-Service function cloud LDAP, drop us a note. Also, please give our hosted LDAP service a try for yourself. Your first 10 users are free forever.